Our featured designer of the week is Roxanne Jegodtka from Edmonton, AB. Roxanne’s challenge: Make a patriotic layout celebrating your country’s birthday and the events you participated in on the day. 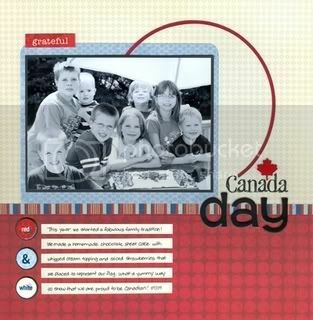 What Roxanne did: She chose to use the brand new Liberty line from Scenic Route to create this great layout about her family’s celebration of Canada Day. A new tradition was begun last year with the baking and decorating of a Canadian Flag cake. Yum! What you can do:Take Roxanne’s challenge and create a patriotic layout of your own. Then, send it to us at ideas@scrapbookandcards.com. We’d love to see your work! Don't forget, today is that last day to make a comment on our 10 Days of Giveaways entry for a chance to win one of fabulous prizes! Make a comment on the June 21st post for your chance to win! Good luck! Beginning in July, we will be drawing for an amazing giveaway every Friday! But, if you read our very first post on June 21st, then you’ll already know that we’re celebrating our 10th issue by giving away some fabulous prizes! Join us for 10 days of celebratory prizes from June 21 through to June 30! A prize package from Gel-a-tins featuring the Super Star stamp set, some embossing powder and gelly gems and the Rock Star paper line from Piggy Tales too! A collection of new and beautiful stamp sets from My Sentiments Exactly! Every Thursday, we will feature a favourite layout that has been submitted to us during a call. We get so many wonderful submissions, and we can only publish such a limited number, so this gives us an opportunity to showcase even more of our favourites! This layout was submitted to us by Sherry Steveson of Wilmington, NC. We loved the theme behind Sherry’s photos, title, and journaling, and the fun, summer colours that she used to tell her story. Don't forget to enter our blog contest! Check out the very first post on the blog. Every Wednesday, we will feature a layout, card, or altered project from our guest designer of the week. We have a talented group here at Scrapbook & Cards Today, so don’t miss this opportunity to see even more of their inspiring work. 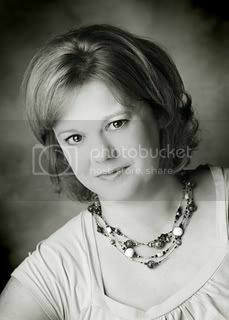 As we mentioned on Monday, our featured designer of the week is Kimber McGray from Carmel, IN. 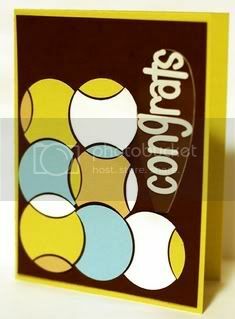 Here is a congratulations card that Kimber made—she was inspired by an image from Pottery Barn Kids. Check out the way she imitated the circles from the wall of the girls’ room on her card. Punched circles from cardstock and then punched “corners” from the circles. Pieced the circles together to create the cool geometric design that she loved from the Pottery Barn image. Applied Maya Road letter rub-ons on a clear Pageframe Designs shape. Don't forget about our incredible giveaway still going on. Check it out in our very first post. We interviewed talented designer, Kelly Goree, and got some insight into her life and into some of her very favourite tips and tricks. Q Tell us a bit about yourself and about your life as a scrapbooker. A I live in beautiful Kentucky with my husband and our three rambunctious boys. I discovered scrapbooking after the birth of my first son (2000) and haven’t looked back! I design full-time for BasicGrey and love spending time creating projects for classes, tradeshows, catalogues, and even TV. Q We’d love to know what trends and products you are most excited about right now. A I love the return to textured and dimensional pages, die-cut papers, and any product with journaling lines printed right on it. I also adore chipboard in any size, shape, or form. Q What personal tricks of the trade can you share with us? Our readers would love to know your design secrets. A I always ink the edges of my photos to make them stand out on the page—for this reason I have a collection of ink in every colour of the rainbow. Also, I use removable adhesive because I am constantly rearranging the placement of things. Finally, I keep a bucket of my newest/most used supplies on my work table and that’s where I go first whenever I start a new project. Thanks Kelly for sharing with us! Kelly did the easy, detailed, expert article for us in the just released summer issue! Check out pages 34-5 to see her 3 great layouts featuring the adorable Cupcake line from BasicGrey. Kelly made this beautiful layout featuring the brand new line from BasicGrey—Euphoria. Here, Kelly proves that shades of pink and purple can successfully be used on boys’ pages. Just look at those cherubic faces! Don't forget to check out our "Top Ten" blog giveway here! Every Monday, our featured designer will pose a challenge to you, our readers! If you choose to accept the challenge, you can send us an image of the completed challenge to ideas@scrapbookandcards.com. We’d love to see your work! Our featured designer of the week is Kimber McGray from Carmel, IN. Kimber’s challenge: scraplift any layout from any past issue of Scrapbook & Cards Today and send us an image of the finished product! What Kimber did: Kimber chose to scraplift Angela Urbano’s “Monkey Boy” layout featured on page 18 of the spring ’08 issue. 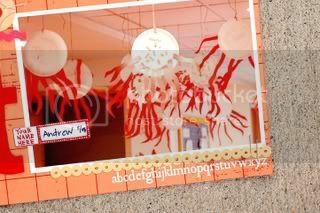 Her lifted layout is called “Pre-K Art” and features fun octopus artwork by her son Andrew. Kimber chose to scraplift this layout because she loves the colour orange! 1. 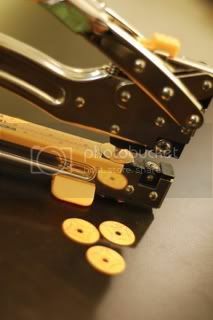 Turn a 1" circle punch upside down so you can see what you are going to punch out. Repeat punching circles. 2. Move the slider on the Crop-A-Dile II (Big Bite) to the 3/16" hole punch mark. 3. 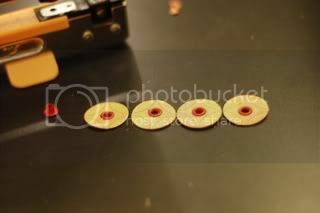 Slide each punched circle under the hole punch. 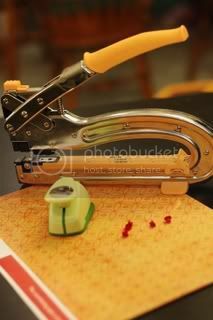 Squeeze handle to punch a hole where the little flower is on the pattern paper. 4. Move the slider on the Big Bite to the eyelet setter mark. 6. Squeeze the handle gently to set the eyelet. Wah-laa! Your very own, custom embellishments. Don't forget to check out the first post for your chance to win some of our fabulous prizes! !